And one more for merry measure! Yarn wreath number two two - totally different for another crafty friend, this one sews, so sewing for her was out. So I decided to make a little decoration for her sewing room. After a not-so-subtle question about her curtain fabric this was what I came up with. I found a tutorial for felt flowers online and they were fairly easy to whip up - especially since I already owned every color of felt from another project - don't you love when you can just go "shop" in your own closet?! So this is going on a turquoise wall - I think it'll be enough contrast to look beautiful. Hope she likes it as much as I liked making it! This is the yarn wreath I made for my swap partner in Holiday Traditions Swap. Knowing that she's a knitter I wanted to make something festive and yarn-y for her but I myself am NOT a knitter. Plus it's like that old "don't bake for a baker" type situation, unless you can make something as good or better then try another idea! So I've fallen in love with all the yarn wreaths on etsy and decided to try my hand at making some. I LOVE love how this turned out and heard from my swap partner that she liked it too - yay! This is our tree in the new place, full of new UN-breakable ornaments this year. Which has worked out well since our little elf has really enjoyed taking them off and trying to put them back on *every* day! She has a few favorites that she checks out every morning, removes, carries around and then re-hangs (with a little help) and yesterday a new ornament came in the mail that she and I instantly fell in love with. I missed Meg's Holiday Traditions swap last year since the baby was still so small and we were SO tired and I was disappointed that she wouldn't be able to host it this year (for good reason though). I was thrilled when Anie of SweetBug Farm offered to host in her place and signed up right away. Thrilled again when I saw the beautiful things my swap partner, Sonia of Peaceful Knitter whips up. LOOK at this gorgeous hand-knit ornament! Sonia MADE this! And it's mine, all mine...wheee! I mean, ahem, it's ours for our tree and we LOOOOOVE it :-) I am not a knitter and I was absolutely in awe of all the teeny tiny stitches it took to make this and all so hand-strung beads. There was a perfectly shaped hole on our tree just waiting for this special addition. I love this swap because it connects you with you the coolest people, who are so talented and giving. It reminds you of your own holiday traditions and opens you up to those of others, which are usually more like yours than not. I love exchanging hand-made things and the thoughtfulness (sometimes seemingly hard to find in this season) that comes along with this swap. Thanks Sonia - I love it! Please go check out Sonia's beautiful blog about knitting, motherhood and like in general AND find a pattern for this fantastic ornament at Peaceful Knitter! And when I know she's received her box I'll share what I made - Happy Holidays! of MOVING! Geez do I HATE moving, absolutely love the new house, love love LOVE but I really hope to never move again. Seriously. So the husband was gone for a month (work), I turned 40 (whee! ), we packed, moved, unpacked AND hosted Thanksgiving dinner in the new place for a dozen family members. I thought getting ready would be the end of me but the holiday was lovely. Such a great space to enjoy family and friends in, we feel thankful and lucky EVERY day! So here's a doodle bug update: SO BIG! She's walking like a fiend (not that Auntie Jenn will believe it, but I swear it's true!) and into EVERYTHING. ALL the time. Yup, we got a busy one. But she's awesome and we're so lucky! Glad to be back here, glad life is settling back down and ready to get back to crafting! This is one of THE latest birthday gifts ever, but better late than never right? I used a charm pack of Cherish Nature by Deb Strain for Moda that I bought at the Fat Quarter Shop. I guessed on the size, leaving out some of the lighter squares - am I the only one would could endlessly rearrange those squares once they're laid out?? Oh charm squares how you VEX me! Could someone please tell me the secret to getting them to all be the same size after they're sewed?! I sew my seam allowances are as close to same as I can humanly get them but when the rows are sewn together there ALWAYS seems to be at least one row of wonky squares that don't line up AT ALL. What am I doing wrong??? I suspect that in all my rearranging, the grainline of some of the squares aren't all the same and some are getting pulled more than others...it's a theory in progress. I decided to use a plain brown Kona on the back - I bought it so long ago I'm not sure which one it is and I'm not near my color chart - the front was busy enough that I wanted the solid back to balance it out. I used a natural linen for the binding, which I thought might slip and slide too much for binding but it worked and looked great! I feel like it can even be reversible now and hopefully be even more useful. Delivered and in use! And look at how I lucked out on the length - couldn't have fit much better if I had had the measurements - yay! Now I need to get started on the birthday gift list for next year so I can be a little better on my timeliness! TO THIS!!! In the space of one short nap (not mine obviously :-). I think my husband may die of happiness when he gets home tonight! 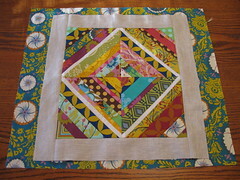 I think it just shows the versatility of mini quilts - they can be beautiful and functional. Oh and that cool tree full of birds? I'd love to say I painted it but it's decal from Target! 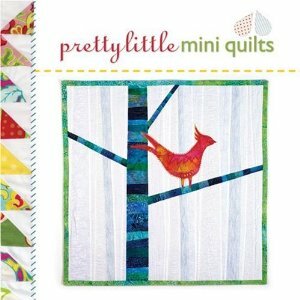 So our first challenge for the AMQG is a mini quilt! Size should be no larger than 24" by 24" - other than that limit please feel free to do whatever inspires you. Some good sources for inspiration are the Whip Up mini Quilt book and the mini quilt month posts from April at Whip Up - if you head over the the blog just search for mini quilts and all the posts from that series will pop up. Sew Mama Sew also had a mini quilt month back in April. Flickr is an awesome place to search for mini quilt images and the Lark book Pretty Little Mini Quilts can also provide tons of inspiration! Mini quilts are so quick to whip up and such a fun place to try new things that we thought they would be the perfect project for our first group challenge. 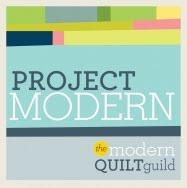 We have such a TALENTED group that we know it'll be an exciting set of quilts. 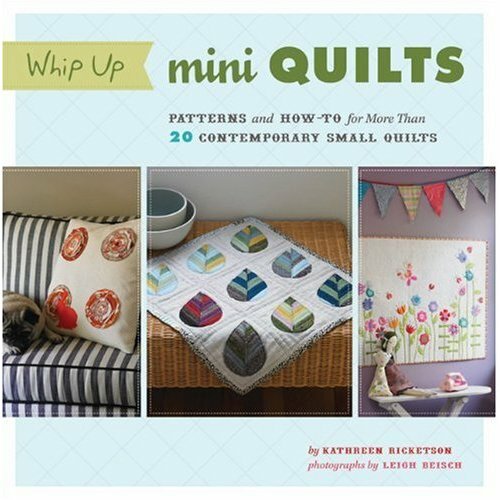 We're going to complete/present our mini quilts at our September meeting ( SUNDAY 9/12/10, 1pm at Whipstitch). If you have joined our group online but not been to a meeting yet this would be a great time to join us in person with your fabulous mini quilt! I'm going to be posting progress on my mini quilt(s) and more photos and links for inspiration during the next weeks so please check back and feel free to share your own progress and inspriations! 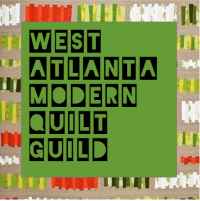 TOMORROW morning 7/10/10 at Whipstitch in Atlanta! If you haven't been to Whipstitch yet you are in for a treat! Deborah (pictured on the left with Patty Young - look how cool she is! She has Patty Young coming to see HER! ;-) has opened a beautiful space near GA Tech, complete with sewing lounge, fabulous fabrics and friendly staff. Shopping here is *way* too easy and I always find some thing I "need". 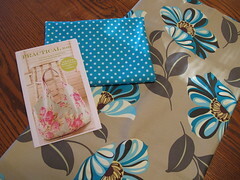 If you can't make it to the store you can always check out Deborah's great etsy store of the same name or her blog - at http://whipstitchfabrics.com/blog/ - she always has fun thoughts and projects to check out! We'll be talking about our next challenge at the meeting tomorrow and it is going to be FUN! I don't want to ruin the surprise so I'll post about that after our actual meeting tomorrow. Curious? 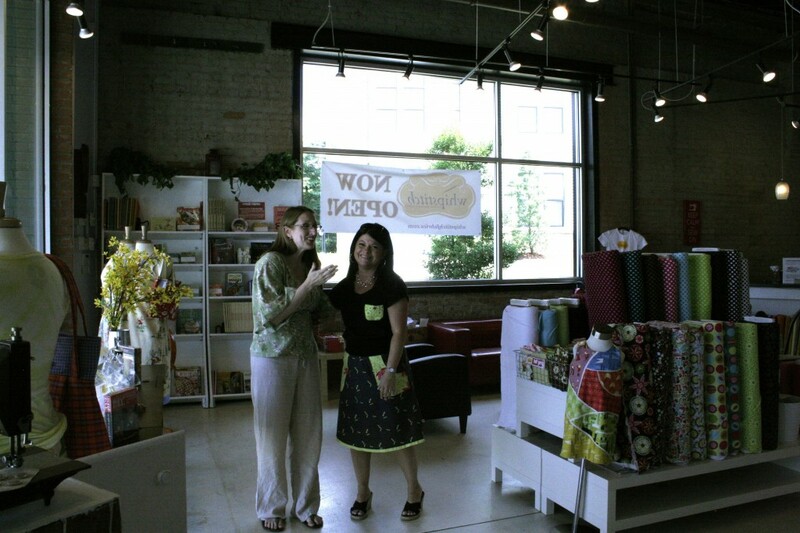 Looking for a talented, fun group of new friends who love fabric and sewing as much as you do? Then please come join us tomrrow at Whipstitch from 10 - 12! We look forward to meeting you! Maybe an ambitious project but one that I'm really curious about - Amanda Jean's (crazy mom quilts) zigzag without piecing tutorial. 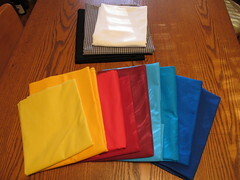 Hopefully this is going to a baby quilt for a friend's nursery done all in primary colors plus black and white. This is going to be another bag to carry around stuff for the doodle bug - pattern looks easy enough but I may add a layer of interfacing to give it a little more structure and cut down on the flopsy factor. I know, I know, I need another bag like I need another hole in my head but come on, you've met me right? What's one more hole?